PROTEIN PUDDING is a tasty high-protein powder dessert. It contains whole protein derived from calcium caseinate and eggs, and glutamine peptides. 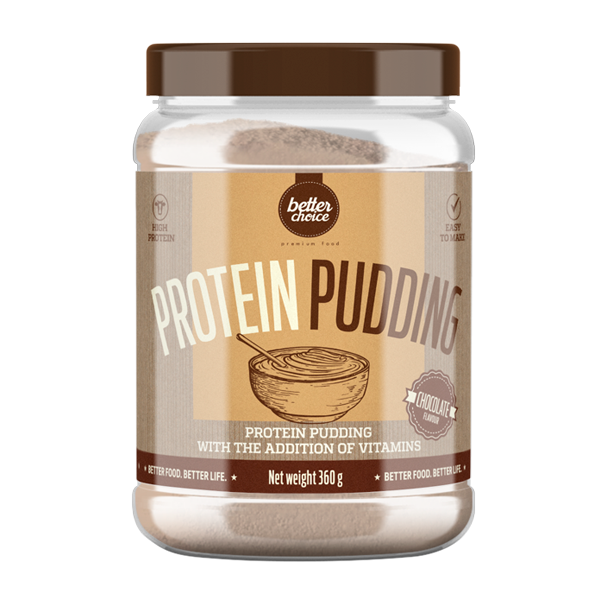 PROTEIN PUDDING contains protein that helps the body grow and maintain muscle mass and keeps bones healthy. The product has been enriched with vitamins such as niacin, pantothenic acid, vitamin B6, riboflavin, thiamine, biotin and vitamin B12 which help the body maintain correct energy metabolism. Dissolve one portion of the product – 40 g (2 scoops) in 200 ml of water or milk; use a shaker or a blender. Empty contents of shaker into a bowl. Chocolate flavour: calcium caseinate (from milk); egg protein; cacao powder; maltodextrins; thickner – modified starch (from barley); L-glutamine peptide (from wheat); aroma; sweeteners – sucralose, sodium cyclamate, sodium saccharin; vitamin complex [vit. C (L-ascorbic acid); niacin (nicotinamide); vit. E (DL-alpha-tocopheryl acetate); pantothenic acid (calcium D-pantothenate); vit. B6 (pyridoxine hydrochloride); riboflavin; thiamine (thiamin mononitrate); folic acid (pteroylmonoglutamic acid); biotin (D-biotin); vit. B12 (cyanocobalamin)]. Vanilla flavour: calcium caseinate (from milk); egg protein; maltodextrins; thickner – modified starch (from barley); L-glutamine peptide (from wheat); aroma; sweeteners – sucralose, sodium cyclamate, sodium saccharin; vitamin complex [vit. C (L-ascorbic acid); niacin (nicotinamide); vit. E (DL-alpha-tocopheryl acetate); pantothenic acid (calcium D-pantothenate); vit. B6 (pyridoxine hydrochloride); riboflavin; thiamine (thiamin mononitrate); folic acid (pteroylmonoglutamic acid); biotin (D-biotin); vit. B12 (cyanocobalamin)]; colour – beta-carotene.